Most people who visit Pondicherry for the first time, expect to find a Goa like place here. infact Pondy is much more than Goa. Of course you don’t get much of the beach shacks, the free flow of booze, countless number of beaches and their beach parties. What you do get in Pondicherry is beautiful architecture, the great French and Chettinad food, good coffee and same cheap alcohol and the very laid back lifestyle. If you have time you can get in touch with your spiritual side as well with a visit or stay at Auroville. 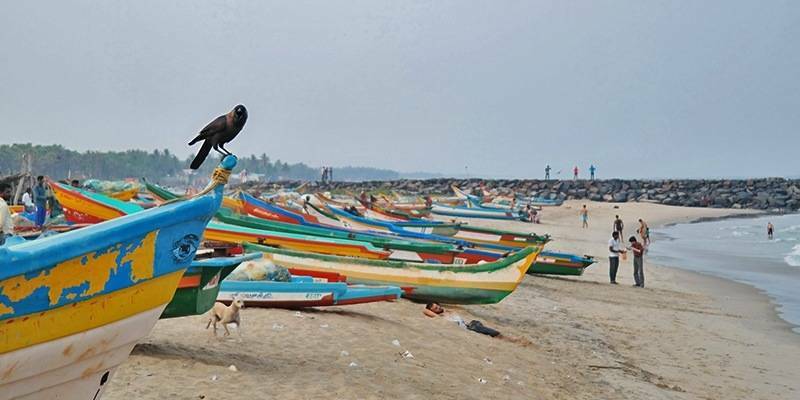 If you are headed to the Pondicherry, don’t miss these top 6 beaches in Pondicherry. 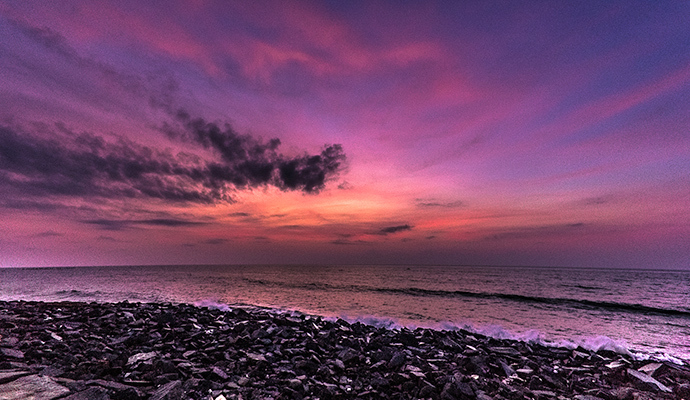 Paradise beach is unarguably the best beach in Pondicherry. A Pondicherry trip would be incomplete without a visit to Paradise beach. This serene beach is not an easily accessible one from the main land and one has to take a boat ride across Chunnambar backwaters to reach it. Mind you the little extra effort is totally worth it. Paradise beach is a beautiful, clean sandy beach and usually not very crowded. Reaching it on a speed or regular boat is an experience in itself. One can take the boat from Chunnambar Boat House. There is beer shop and you can rent beach beds to relax. 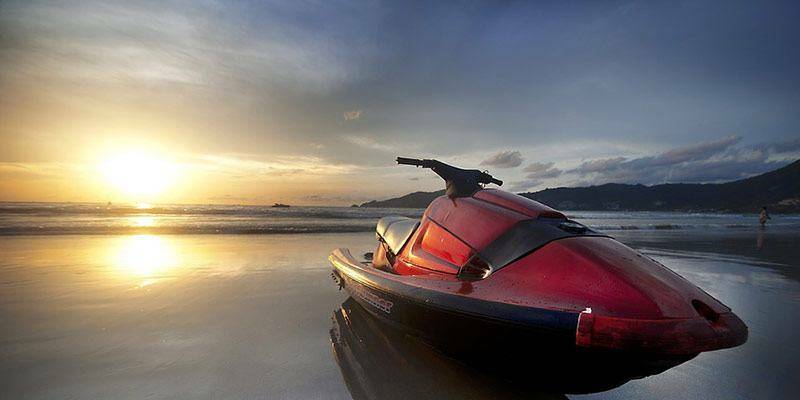 Some water sports activities are also available here. Paradise beach is a beautiful, clean sandy beach and usually not very crowded. Reaching it on a speed or regular boat is an experience in itself. Not a typical sandy beach, Promenade beach is about 1.5 KMs long stretch of rocky beach with a wide pavement ideal for a walk. The road running parallel to the Promenade is closed to traffic every day from 6 in evening to 6 in morning. Just before sunset Promenade beach comes alive and the crowd keeps pouring in. 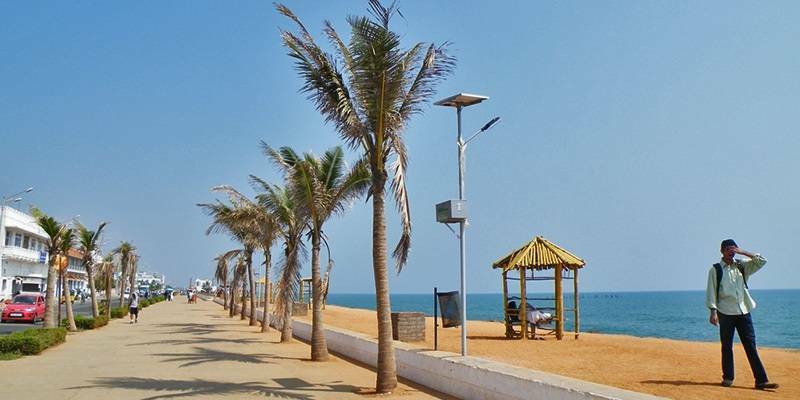 A walk along the promenade is a must-do experience of a Pondicherry visit. There is a sea facing café here open 24/7 which serves some great food and shakes. Promenade beach is also called as Pondicherry beach by few. Promenade Beach is the closest beach to the french quarter side of the town. A late night stroll is also a good idea when the cool breeze blows and environment is soothing with crowd missing. Veerampattinam beach is a long beach and the best beach around Pondicherry after Paradise beach. 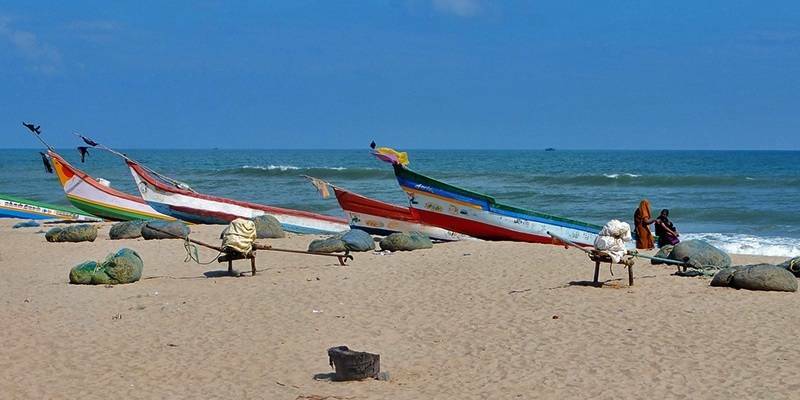 Veerampattinam Beach is about 7 KMs from Puducherry and is on way to Cuddalore, just before Chunnambar Boat House. The beach lies between rivers on both sides and you can spot lot of fishing activity here. A perfect place to visit for the sunrise or sunset view. Auro Beach or Auroville beach is not really in Auroville but named so because it is close to Auroville Bus stop on the East Coast Road. This is a small beach and very close to Serenity beach. You will spot few fishermen and their boats on the beach and mostly you won’t find lot of people here. 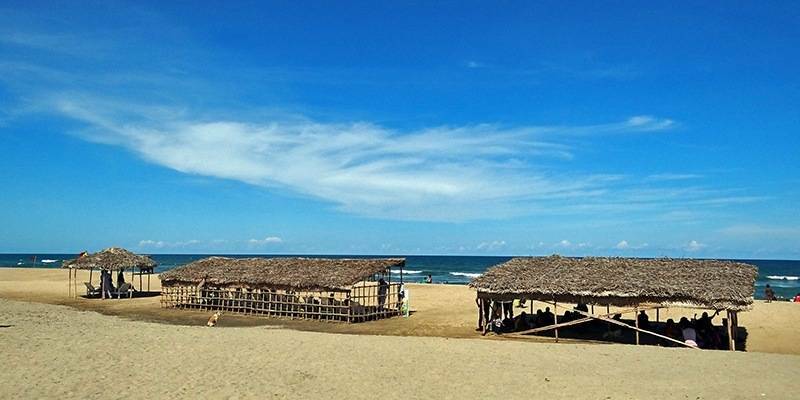 This beach can be easily visited on way to Auroville which is one of the most popular tourist attractions in this destination. Named after its namesake restaurant, and not the best maintained beach around Puducherry, Serenity Beach is still worth a visit nonetheless. Best times would be to visit in mornings or evenings. There are a few restaurant and café so you can spend some good time on Serenity Beach. Also it’s a good spot to go surfing as waves crash quite heavily here. Serenity Beach is about 10 KMs north of Pondicherry off the East Coast Road. At one of the northern-most end of the Pondicherry, there is beautiful relatively clean beach not much crowded. Thanks to lack of crowds except few fishermen with their boats, this beach is frequented by mostly foreigners and few tourists. 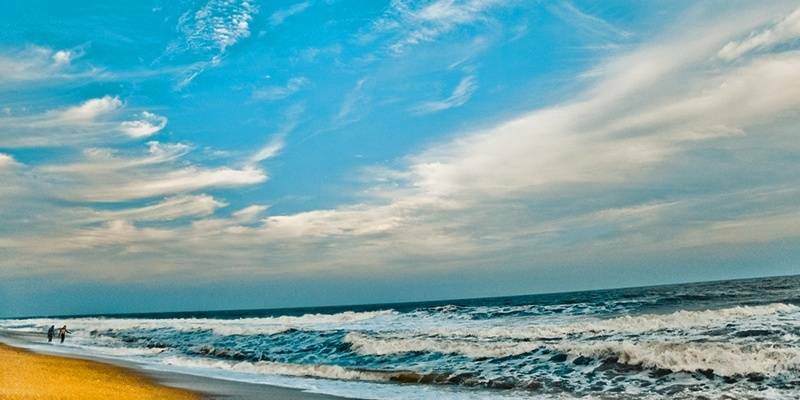 Although this nowhere close to an exhaustive list of beaches in Pondicherry, we have tried to list best beaches worthy of your visit based on different parameters such as crowd, facilities, activities and cleanliness.